Wow, where has the time gone?? Oh yeah, in the whirlwind that is the holidays time flies by even faster! So December's Obsessions post is coming at you a few days late. But hey, better late than never, right?? I mean, I'm still in awe that it's 2013, let alone that another month has gone by!! I don't know if it's because my feet have been blocks of ice all month long or what, but I've got socks on the brain. 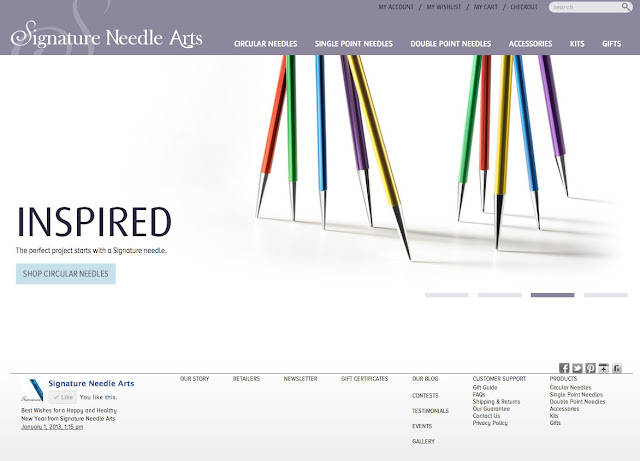 And what do all my needles want to knit lately? Yup. Socks. Thick, worsted weight house socks...plain vanilla stripey socks...intricate Cookie A socks...fine gauge socks (for my regular every day shoes! )...knee highs... You name it, I seem to want to knit it. I also think that all the heavy duty crafting that I was doing all December long is another reason why I want to knit socks. It's small, simple, and definitely portable. Last January I made it a knitterly goal to knit more socks...that was a fail. I had managed to knit only 2 pairs last year with another 3 still on the needles. So I made it a goal again for 2013. Not to mention that I had to get rid of at least 5 pairs of commercially made socks that were riddled with holes, and I made the decision long ago that I was going to replace all my machine-made socks with hand-knit ones. Am I crazy for wanting to do that? Hmm... Either way, bring on the sock yarn!! Since I had socks on the brain it's only natural that I would think about knitting needles for socks. At least, it feels natural to me to think about that! I discovered long ago that I cannot knit socks on bamboo or wood needles, as my gauge gets way too tight and I feel like I'm going to snap my needle in half. So I've replaced my needles with Knit Picks' Nickel Plated ones. I've also discovered that I like to knit my socks using a 2.25mm (US 1) needle. So you bet I have a ton of needles in that size. Well...since it's my plan to knit a drawer full of socks (eventually, that is! ), I've been thinking of getting a pair of Signatures in my most used sock needle size. I dream about the extremely pointy tips (I heard they can draw blood...they are that pointy! 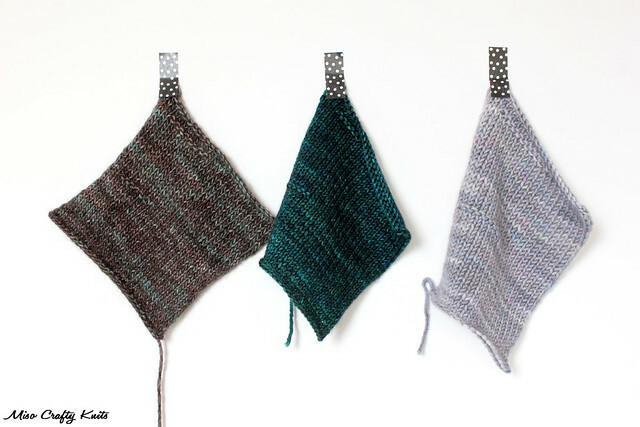 ), and about how fast I can whip up a pair if I had these beauts in my knitting needle arsenal. Ooohhh...I think I'm going to have to go look at more photos of them!! These past few months my gauge has been all over the place. Normally my gauge is pretty consistent and I can usually predict what size needle I'll need to use for a particular yarn weight, fiber content, and project. I'm not sure if I've just been overly stressed out (which I am) or what, but my gauge has been getting tighter and tighter by the day. Yesterday I even had to frog an entire shawl project because my gauge had changed so drastically in 2 different spots that no amount of blocking was going to fix it! Yikes! I've been drinking this tea practically by the gallon ever since I bought a bag of it at the beginning of December! Move aside Santa's Secret, Mama's got a new favourite!! I love this tea SO much that I've already powered through 2 tins of it!! Yes, I drink a lot of tea. But Cocomint Cream is caffeine free. And is extremely yummy. 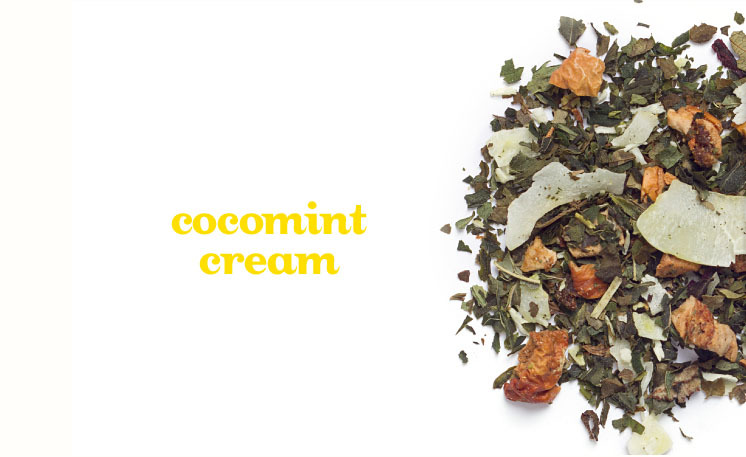 I absolutely LOVE peppermint tea - the mintier, the better - throw in some coconut, oh yeah. I'm totally there! Speaking of which, I think I'm going to make myself a cuppa of this right now! I'm sure you're all well aware of how much I love mason jars. And my Cuppow, which is awesome for sipping hot bevvies out of. I was really hoping that the makers of the Cuppow would make their wide mouth Cuppow similar to the regular mouth version in that the hole in the spout is large enough to insert a straw. Sadly, they have yet to do that. 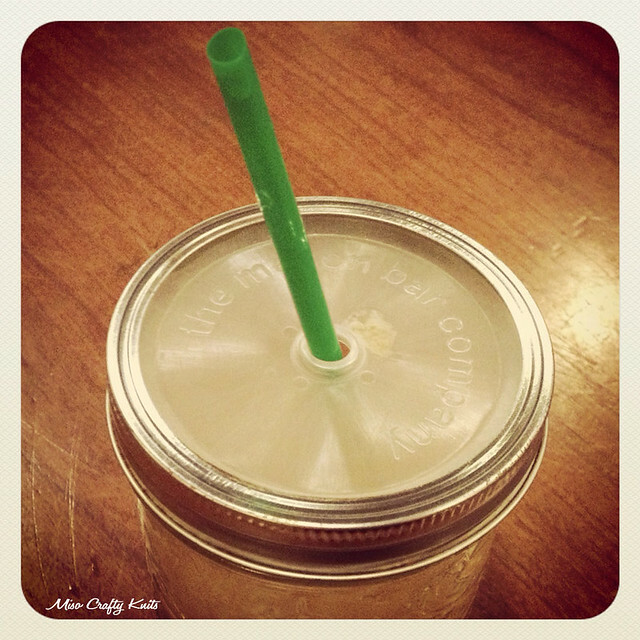 Last month I discovered the The Mason Bar Company and their mason jar tumbler lid (it's BPA free too!). This tumbler lid comes in both sizes and has a hole smack dab in the middle that's the perfect size for a straw. You can bet your MCN yarns that I snatched up a set faster than you can say yarn sale! While I know there's not a huge difference between this lid and the Cuppow, it's just nice to have the option of being able to sip a cold beverage through a straw (um...Frappuccino anyone?) and so far it's been handy during those knit-a-thons when you're winding yarn like no tomorrow and fiber-y fluff flies everywhere. You know what I'm talking about. There you are, winding 3 skeins of yarn, and you see little strands of fiber all over the table. If you wind yarn a lot, sometimes you see little fiber bunnies gently rolling past in the breeze (and if you're crazy, you can distinguish exactly what project/yarn that bunny came from!). There's been many a time when I would go to take a sip of water and notice that some of that lovely fiber has landed in my jar. Now, I'm all about having your daily dose of fiber (no pun intended) but really? Like this? Hmmm...I might be nutso but that's where I draw the line. Oh, and another reason why I'm loving the tumbler lid: I finally get to use my little collection of fun paper straws! Who says that you can only have fun in the summer with these bad boys? Yeah, I'm totally breaking the rules. Bring on the straws! Score yourself a tumbler lid too from one of these places: either The Mason Bar Company's Etsy shop or for you fellow Canadians, Greenmunch also sells them (and the shipping is free on these babies). PS: the latter also has an awesome selection of paper straws! But shhh! I'm not enabling! Yup, you read right. Headlamps. Laugh all you want. My headlamp has become one of my most used items in my knitting bag this season. I kid you not. 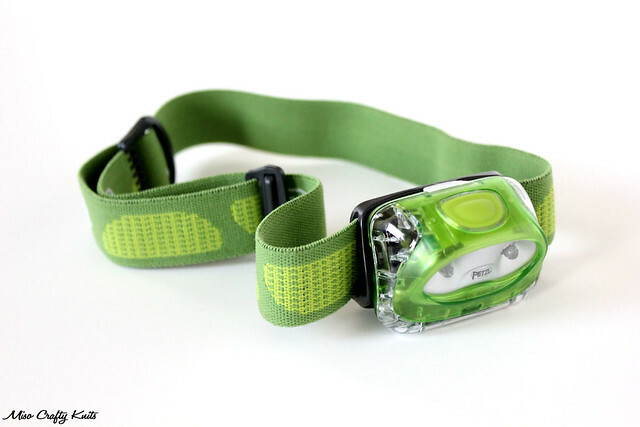 All month long I kept commenting to Brett on how a headlamp would be awesome and oh so handy for ______ (insert 'difficult knitting in low light situation' comment here). All December long I was finding myself waiting for Brett in a dark truck, cursing that I couldn't see my stitches (and I hate leaving the truck idling while waiting 5-10 minutes for Brett to get off work). A few times I was stuck in traffic (once we were stuck for almost 40 minutes without moving a single inch - there was a major accident on the highway), and sure enough, I couldn't see jack at what I was doing. Brett thought I was hinting at what I wanted for Christmas, and I guess my knitting subconscious was, but really I was honestly only saying what would've been helpful at the time. But once Brett mentioned Christmas present, I thought, why not? So I sent him a link of what I wanted. The photo above is what waited for me under the Christmas tree! So glad that Brett got the colour I would've picked if I had gone out and got it myself. My headlamp is the most basic of headlamps. I know there are much fancier ones out there but mine is specifically for knitting/reading purposes. Although, I do plan on using it this summer when we go camping (re: outhouses...yuck! ), and already it's been a lifesaver for when I needed to look for a Lego piece that was dropped in the truck and was only told about it moments before a little someone's bed time. I'm sure further down the road I might want to step it up to one that can re-charge via a wall outlet, but for now, this is perfect. And it's my most favourite Christmas gift that I received this year! i totally want that 2.25 circular too!! i was just telling ginny at work yesterday that i really need to restrain myself from clicking "buy now".. but trust me, there IS such a thing as too sharp.. no more stiletto tips for me. one set of unused 2.5 dpn's is enough!! Hahaha...Liisa I have yet to experience this "too sharp" business! So until I do, I still want the sharpest, pointiest needle possible!! ;) If I was able to knit with DPNs, I would've asked if I could borrow them to see if I liked knitting with them. But I really don't know if I could go back to DPNs after making the switch to Magic Loop! Hello. What is the red sock pattern? Love!